To get to your settings, click the Yammer settings icon , and then click Edit Settings. In your settings, click Profile. Fill in the information you'd like to share with your co-workers, and then click Save. 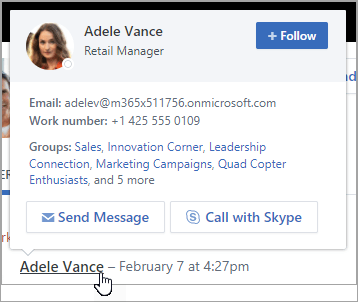 If you sign in to Yammer via Office 365, your Yammer profile is automatically populated with your Office 365 profile information. If your Office 365 profile information changes, it will overwrite any changes you make to your Yammer profile. It is not possible to delete your Yammer profile. Click Browse, and select a new photo. Note: If you sign in to Yammer via Office 365, even if anything in your Office 365 profile changes, the photo you uploaded in Yammer will not be replaced by your Office 365 profile picture. When a person hovers over your name anywhere in Yammer, they see your email and phone numbers. When they click your name anywhere in Yammer, they'll see your home page. The Info section of the right sidebar shows any fields the admin has made public that contain data. Other people can search for you by name, or search based on profile information. For example, they could search for you based on your department, location, or expertise. In your settings, click Networks. Next to a network name, select Edit Notifications. To leave an external network, select Leave Network next to the network name. In settings, click Account Activity. You'll see each time you accessed Yammer, and the app or device you used. If you want, you can logout from a Yammer session by clicking Logout next to an open session. This is helpful if you've lost your device. In your settings, click My Applications. If you have any applications installed, you'll see them listed. To remove access to an app, click Revoke Access. To add an app, select the Yammer settings icon , and then click Apps. 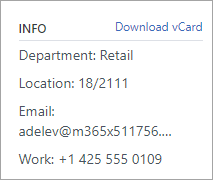 For more information, see Office 365 Connectors in Yammer. In your settings, click Notifications. If you are a member of multiple networks, you must change notifications on each network. Click a network name to change the notification settings for that network. Select the notifications you want, and then click Save. These settings do not change which notifications you get on your phone. To control push notifications on Android phones, in Yammer on your phone, click the menu, and then go to Settings > Notification Settings. 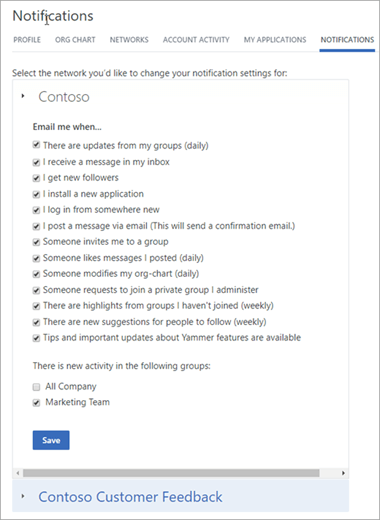 For more information about notifications, see Control your Yammer email and push notifications. Note: When you change your language preference here, the change applies just to the web and desktop Yammer apps. For mobile devices, Yammer takes the language setting from the device's language setting. The language setting is used for all the labels in Yammer. If your Yammer admin has enabled translation, a Translate option appears in the options bar under all messages entered in a different language. In your settings, select Preferences. Select the current language, and choose another. Can I unsubscribe or delete my Yammer account?